Tom Valenza has merged his interest in American history and antique eyewear to form the Historic EyeWear Company, offering a line of reproduction antique spectacles for smart, independent, adventurous men and women who have a strong connection to our American heritage. He and several members of his optical family came to Massachusetts in April for the 2011 Ocular Heritage Society meeting, which included several wonderful tours in the state hosted by Dr. David Fleishman. Tom's parents started out as opticians in New Jersey in the 1960's, where the state requires a technician's licensing exam after 2 years of practice and the ophthalmic dispenser licensing exam after 4 years of practice. Tom first learned glass lens edging in the 3rd floor hallway lab of his parents’ apartment in Newark while helping them do lab work for their first optical shop on Bloomfield Avenue in North Newark. Eventually, additional stores were opened in Caldwell and Nutley, New Jersey where Tom's sister Susan has recently celebrated her 30th year of practice. Susan's daughter Maria received her ophthalmic dispenser license last year marking the third generation of Valenza family opticians. Their mother Joan still comes in to help out when Susan gets busy. Tom received his ophthalmic dispenser license back in 1972, and after twenty years of watching the optical industry change with more chain stores entering the market, ophthalmologists and optometrists dispensing eyeglasses and county colleges churning out hundreds of dispenser licenses every year, Tom decided to move on, accepting a position with a local water commission, attaining the position of Licensed Water System Operator/Superintendent where he has worked for the last eighteen years. He has recently retired from the commission to pursue his Historic EyeWear Company venture. 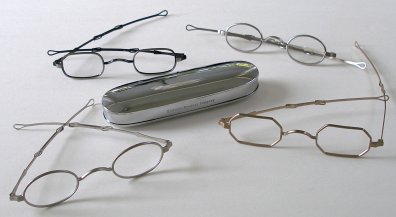 Tom started collecting spectacles in the sixties. He noticed, as have many of us, that people portrayed in historical reenactments, whether live events, movies or television often wore spectacles that were historically inaccurate for the time period represented. Lack of information pertaining to eyewear coupled with small size and difficulty locating original antique spectacles, contributed to this inaccuracy. 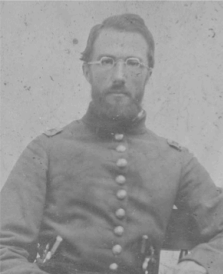 Eventually, Tom saw an optical niche for spectacles that were historically correct but larger in size than original antique spectacles, to allow for a better fit for today’s' actor/reenactor community as well as the general public. 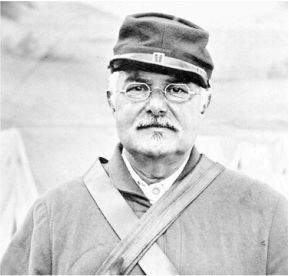 The size of an average man during the Civil War era was approximately 5'6" tall, weighing 135 lbs. 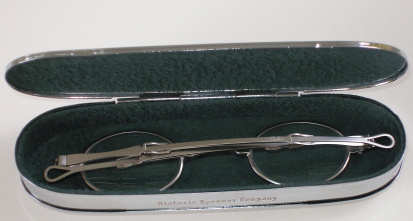 After filing the trademark application for 'Historic EyeWear Company - Keeping History in Sight' Tom started meeting with frame manufactures at Vision Expo in 2004, seeking a manufacturer for the line he was creating as accurate reproductions of antique spectacles from the period representing 1835 to 1880. 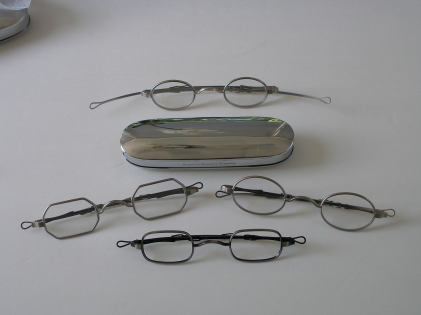 Historic EyeWear Company frames are available in three shapes: octagon, oblong, and oval. All were popular during this time period, and are available in gold dust, silver dust, tarnished silver and tarnished brass finishes. Once the spectacles were in production, Tom went back to the drawing board to create a case that was modeled after the originals used in the 1800’s. It was challenging because it required a three piece construction shared between two different factories in order to get the pieces cut and welded, the case plated, engraved and finally, lined. Over the past eight years, Tom has spent a great amount of his time and energy at considerable cost to have his frames produced, and is now working full time on his new venture. Online sales have been promising with sales throughout the USA and as far away as Queensland Australia, Dublin Ireland and Queen Charlotte British Columbia, Canada.